I love filling my home with inviting fragrances. I can't necessarily light a candle in each and every room, however. That's why I've been loving the wide selection from rareEARTH Naturals. They have candles, diffusers, room mists and even perfumes.. all featuring 100% pure essential oils. I've never had much luck with diffusers lasting or providing enough fragrance in the past. This Dream reed diffuser has blown every other diffuser out of the water. With just one rotation of the reeds after the first hour, this diffuser has provided constant fragrance without any sign of weakening. I initially had it in my living/dining room and it was strong enough to fill the entire area with fragrance, noticeable even from adjoining rooms. I then moved it to the guest room and each time I walk past, I can smell its aroma. This particular diffuser features lavender, armoise, and clary sage. At first I only noticed an herbal smell, but as it gets going, the comforting lavender comes through. These diffusers are perfect for bedrooms where you aren't necessarily able to keep an eye on candles as they burn. The bottle itself is hand blown Italian glass which makes a beautiful decoration and can be reused once the oil is gone. When all you need is a burst of freshness, these room mists are really convenient! This scent features lemongrass and lemon peel making it a great choice for the kitchen area. I love citrus for my kitchen to bring brightness and freshness. This scent makes the room smell as if I have just cleaned, even if I haven't! Whether the garbage area needs a little boost or last night's dinner is still lingering, this room mist is an easy "quick fix" to freshen any room without harmful chemicals. The rareEARTH pillar candles each feature a unique, one of a kind design that serves as a decoration all on its own. These candles are made from 100% GMO-free soy and beeswaxes. As this pillar burns, the outside edges and design are not disturbed. The candle burns down the center so there is no dripping wax or mess. I simply put this candle on a base on my table and that's it! 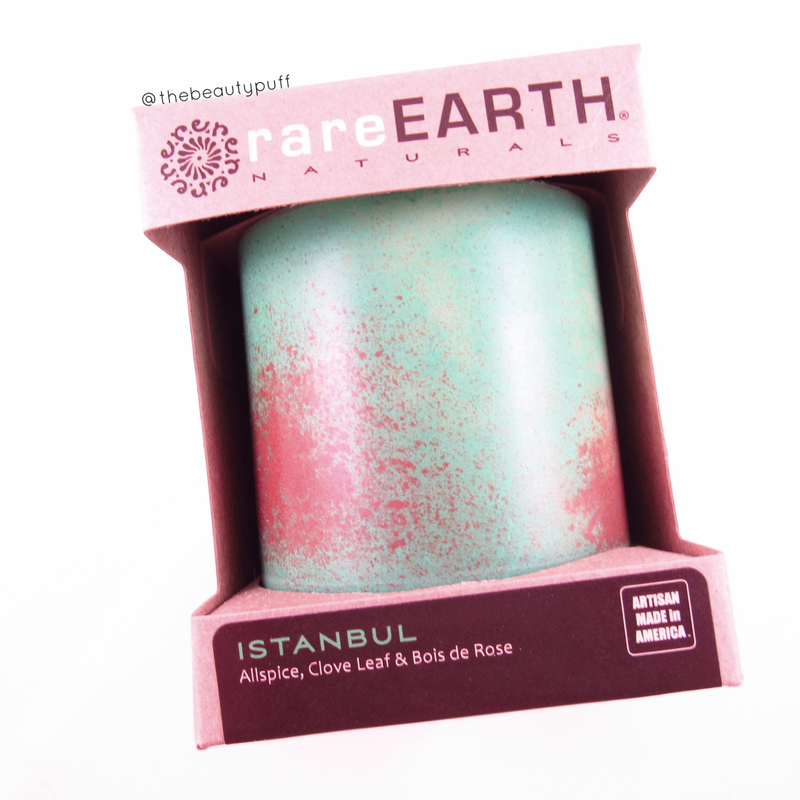 The Istanbul pillar features allspice, clove leaf and bois de rose. It a warm scent with a spicy, woody tone. It makes for a very comforting living space. Other scents include combinations such as lavender, lime & spearmint and tangerine, grapefruit & sweet orange. For a more compact option, these travel tins really pack a punch with scent. 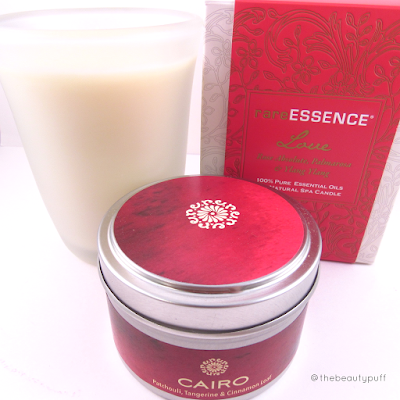 Cairo is a combination of sweet patchouli, tangerine and cinnamon. It is a great blend of sweetness, freshness and spice all in one. Don't be deceived by its size, as this candle easily fills a room with fresh fragrance. This scent is a great option for fall too! It is also available in the Pillar variety with a beautiful design of deep and vibrant red, perfect for fall and holiday decor. If you are looking for a long-lasting, fragrant candle to go with any decor, you will love the Spa Candle line. The 7.5oz Spa Candles are in beautiful frosted glass which will suit any room in the house. The smaller version, the Spa Votive, feature a printed glass much like the Diffusers. I love the simplicity of the frosted glass - and the scent is amazing. The Love scent features rose, palmarosa and ylang ylang for a sweet floral mix. The Diffusers, Spa Candles and Room Mists come in corresponding scents so if you find one scent you love, you can get the different varieties for different rooms in your home. Or mix and match! 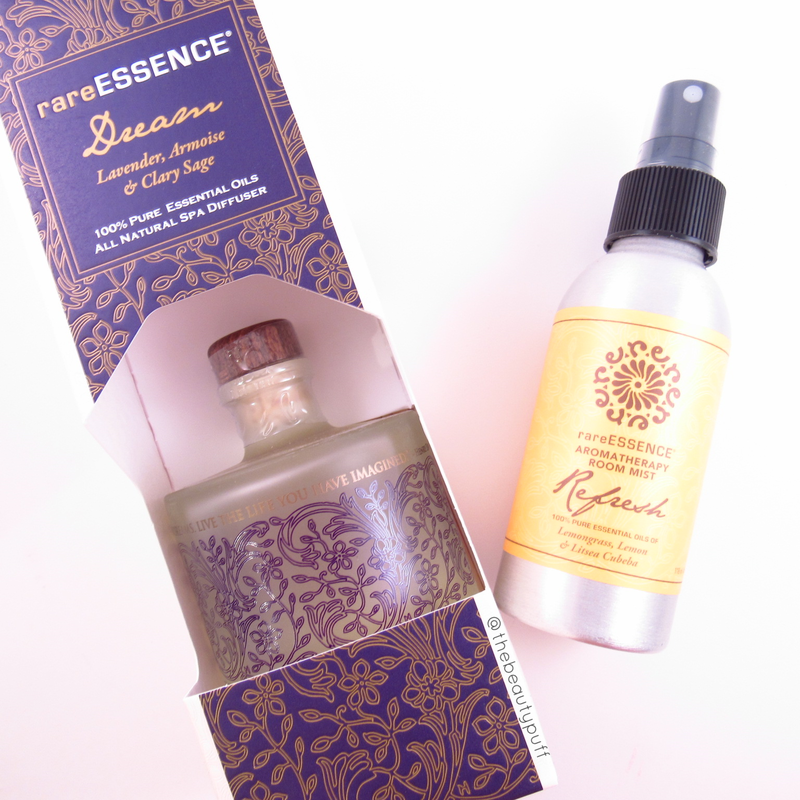 For a unique spin, rareEARTH also makes 100% essential oil perfume. These perfumes have no harmful toxins or chemicals and come in a convenient, yet beautiful, roll-ons or a larger sprays. I like to change my scents often so I love the roll-on size. It's easy to travel with and doesn't take up much space. Beleza is a floral scent that features jasmine, one of my more recent favorite scents. Each perfume has a description of the notes so you can find the right scent for your style - whether you want something fresh and floral or warm and spicy. You can also get a scent sampler with four different scents which would make a beautiful gift! Whether you are looking for a special gift or scents to fill your home, rareEarth Naturals has a fantastic selection!